Following our recent email asking you to send us your resource lists, we have had a fantastic response from course organisers. As we have a two week turnaround on creating resource lists using Talis Aspire and our interns are only with us until 5th September, we are imposing a cut of date of 25thAugust. Any lists received after 25th August will be added to our queue and best efforts will be made to ensure they are ready for 15th September, however, no guarantees can be given. Please remember that creating resource lists yourself is quick and easy to do. Email library.learning@ed.ac.uk to register as a List Creator on Talis Aspire. A series of short user guides, including a guide on Getting Started, is provided on the Information Services website. This entry was posted in Library, Research & Learning Services and tagged Library Learning Services, Resource Lists @ Edinburgh on August 20, 2014 by Stephanie Farley - Library Learning Services. This means we need more lists! Whether you have started creating your own lists and would like help with additional lists, or if you have been interested in Resource Lists but not yet had the time to create one yourself, now is the perfect time to send us your lists. Having Katrin and Gemma available to enter reading list information into Resource Lists @ Edinburgh is a fantastic resource for staff to utilise and is only available for the next four weeks, so do please do make use of this opportunity. This entry was posted in Library, Research & Learning Services and tagged Library Learning Services, Resource Lists @ Edinburgh on August 13, 2014 by Stephanie Farley - Library Learning Services. 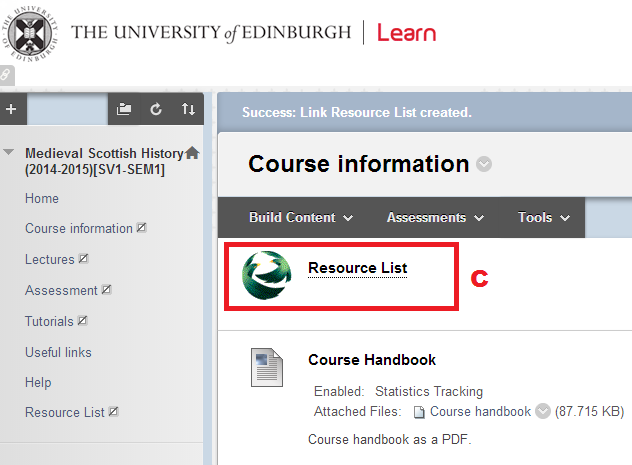 Resource Lists @ Edinburgh has integrated with Learn and Moodle! We are very pleased to announce that Resource Lists @ Edinburgh is now integrated with both Learn and Moodle! Important: Your resource lists MUST be linked to the hierarchy. If this has not been done then the VLE (Virtual Learning Environment) will not be able to locate your lists. The hierarchy is a virtual representation of the organisational structure at Edinburgh and is taken from the Degree Regulations and Programmes of Study (DRPS). For more information on the hierarchy and linking your lists we have created a step-by-step guide: Linking to the hierarchy (PDF). There are three options when using the Resource Lists tool within Learn. a) You can create a menu item for Resource Lists so that the link is always available to your students from anywhere in the course. 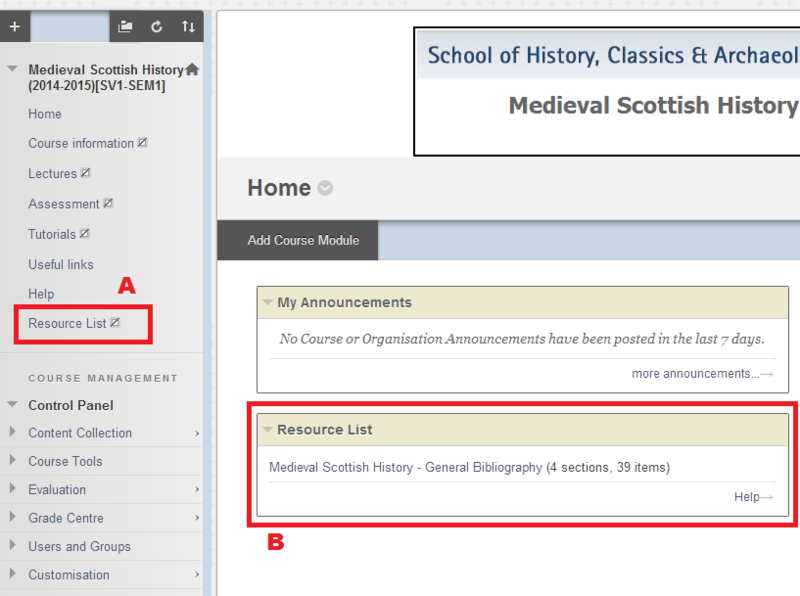 b) You can add the Resource List tool to your course module page. Any lists linked to the hierarchy for your module will display in Learn. c) You can add the Resource List tool at any point in the course content and any lists linked to the hierarchy for your module will display with the Resource Lists icon as shown below. In Moodle a block for Resource Lists is added the same way any other block is added, by clicking on the drop down menu in ‘Add a block’ and selecting the ‘Resource Lists’ block. The block can then be moved to a suitable location within your Moodle page. Any resource lists that have been linked to the hierarchy for this particular module will be recognised, displayed and linked to from the block. This entry was posted in Library, Research & Learning Services and tagged Learn, Moodle, Resource Lists @ Edinburgh, VLE on August 4, 2014 by Stephanie Farley - Library Learning Services.